In the basement is The Shop, which is a music club that will feature rock bands and indie musicians any given week. On the roof is a 1200 squarefoot kitchen garden that will supply the herbs, fruits and vegetables for the restaurant. Amazing. Sustainability at its best. But the best part about Parts & Labour is not the sophisticated casual atmosphere, sustainable food model, or the club downstairs. The best part about Parts & Labour is in the food. Glancing over the eclectic menu when we got seated, items like braised pork belly, fried pig face, and lamb heart immediately jumped out at me. Not that everything on there is so edgy, but it certainly sets the tone of what to expect… even the food is rock ‘n’ roll. A huge accolade to everyone’s favorite Nightchef, Matt DeMille and Oddfellows’ ever-popular chef, Matty Matheson. At our table, we tried as much from the menu as we possibly could. Everything was phenomenal. For the more adventurous eater (and even if you’re not) I’d strongly recommend trying some of the more unusual things on the menu. You won’t be disappointed. We ordered the fried pig face, which is served on a bed of light salad greens and caper berries, and the lamb heart tartare, which was a beautiful blend of tangy-sweet-savoury flavours and of a fantastic texture. 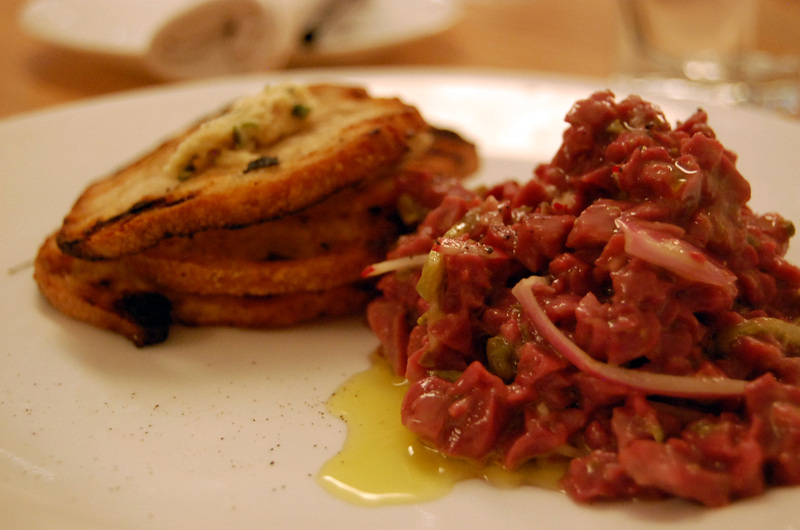 I’m already having cravings of the lamb heart tartare – and it hasn’t even been 24 hours yet. My stomach’s muscle memory is a powerful thing. For our mains, we ordered the tagliatelle served with a braised short rib ragout, and the peppercorn crusted horse tenderloin served with whipped horseradish, bone marrow, broccoli rabe and mash. 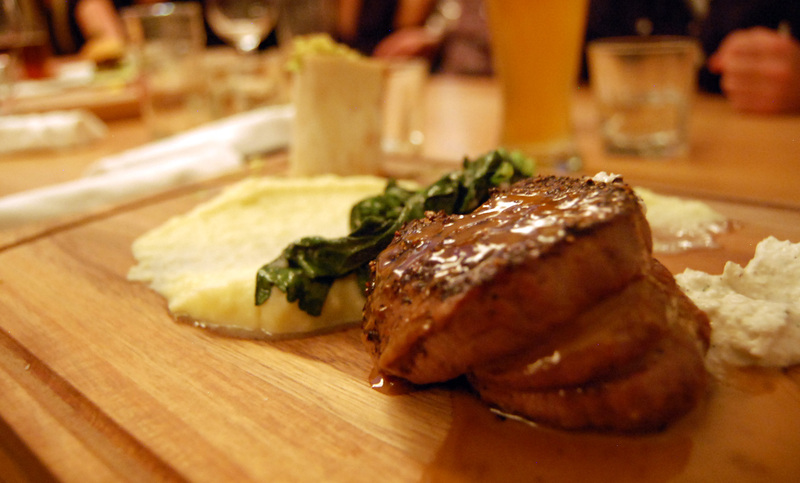 I’m not sure what I loved more – the melt-in-your-mouth short rib ragout and perfectly done home-made pasta or the beautifully seasoned tender horse steak and bone marrow served right in the actual bone. Admittedly, a small part of me wanted to ask to take the bone home as a keepsake – but the rational, adult side of me prevailed. Likely for the better – there’s something a little morbid about keeping the bone of the animal you just ate – even if it is just a serving vessel. Further, I’m sure Matt and Matty don’t want to keep hollowing-out countless bones their patrons keep, and a saucy bone in a handbag probably isn’t such a brilliant idea. Nonetheless, I’m always tickled by creative serving methods. All in all, a fabulous night. If you haven’t made the trek down to 1566 Queen Street West yet, I highly recommend it. The service is fantastic, atmosphere is both eye-candy and comfort rolled into one, and the food – as I mentioned – is mouth-watering delicious. We’ll definitely be back. Congratulations, Parts & Labour on your grand opening! I’d say it was a raving success – we’re excited for many more dining experiences to come. View full image gallery on Flickr. 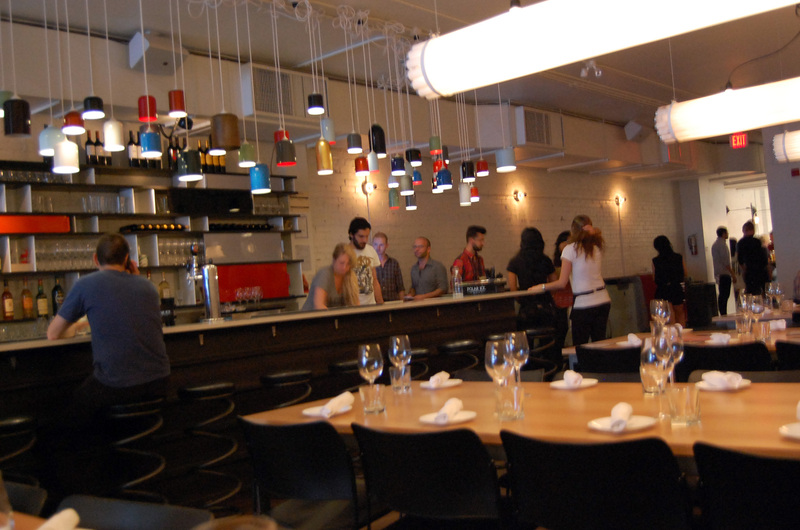 This entry was posted in Reviews and tagged drink, food, foodie, hang-out, P&L, parkdale, parts & labour, Queen Street West, restaurant, Sustainability, Toronto, vintage modern. Bookmark the permalink. Thanks! It’s one of our favorite spots. The menu changes up seasonally, so if they’re not on their winter menu yet, they will probably be on it soon. Let me know what you think.